Emerging ahead of leading Asian corporates, Hayleys Plantations’ Talawakelle Tea Estates PLC (TTEL) was crowned as winners of Asia’s Best Integrated Report at the 4th Annual Asia Sustainability Reports Awards (ASRA) in Singapore. Setting a new benchmark for Sri Lankan corporates, TTEL’s annual report was ranked ahead of leading Asian companies such as Maybank-Malaysia, Singtel-Singapore, Ajinomoto Co., Inc-Japan, Tata Motors Limited-India & Orient Overseas (International) Limited-Hong Kong. “We are defined by a firm commitment to excellence and continuous improvements in everything we do. Our commitment to a strong framework of corporate governance and accountability has allowed us to thrive and enabled our organization to be transparent and accurate in reporting into all aspects of our performance. 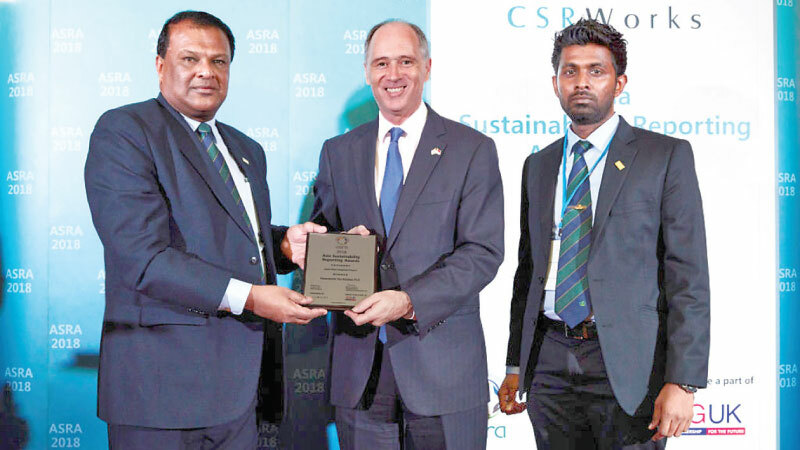 This in turn has facilitated Hayleys Plantations to deliver excellence to all our stakeholders, and we are deeply encouraged by our victory on such a prestigious international platform as the Asia Sustainability Reports Awards,” Hayleys Plantations Managing Director, Roshan Rajadurai said. Talawakelle Tea Estates PLC was also nominated as a finalist for Asia’s Best Materiality Reporting, Asia’s Best Environmental Reporting, Asia’s Best Carbon Disclosure, Asia’s Best SDG Reporting & Asia’s Best Report Design. A record 82 companies from 14 countries made it to the final round of the 2018 Asia Sustainability Reporting Awards across 17 categories. “Sustainability reporting has become an important tool for investors and stakeholders to assess a company’s full value” said Rajesh Chhabara, managing director at CSRWorks International. ASRAis an international platform that recognises and honours sustainability reporting leaders in Asia. Senior business leaders from 13 countries attended the exclusive awards ceremony hosted by the British High Commissioner in Singapore Scott Wightman. Dignitaries from diverse fields including academia, non-profit, embassies, trade associations and advocacy organisations were also present at the ceremony. The awards were presented by Guest of Honour Jessica Cheam, managing editor of Eco-Business, The British High Commissioner Scott Wightman and special guests Dr Lawrence Loh, director of Corporate Governance, Institutions and Organisations at NUS Business School and Dr Wu Huijuan, Assistant Director, Singapore Institute of International Affairs. CSRWorks International, a Singapore-based firm focusses on sustainability consulting, training and thought leadership, created the non-profit Asia Sustainability Reporting Awards to inspire Asian organisations to adopt sustainability reporting and integrated reporting. The performance of Hayleys Plantations at the ASRA is the latest in a string of accolades and prestige secured by the organsiation.